Laughing, the change of our seasons, animals particularly dogs, good food, friendship and family, sharing, log fires. Cruelty [physical or mental] feeling intimidated, insincerity, celery. Growing up experiences in my adolescent years left me with little confidence or self worth. Until I met my first counsellor I did not realise that I could change things about myself and my life in a positive way, and there were always choices I needed to know where to look and believe in myself and that I deserved a better quality of life. On reflection over 30 years ago this was a completely liberating experience for me, leading me to peruse my love of Psychology and becoming fascinated with what ‘makes people tick, I knew when the time was right I would go back to study and become a qualified counsellor, offering some of the life skills to others that had given me such a helping hand. I adore the countryside and nature. I am lucky enough to live and work amongst both, in the Tamar valley on the Devon and Cornwall border, about 2 miles from the beautiful river Tamar, as the ‘crow flies’. Water whether it is the river or the sea or a pond I have always found very relaxing and replenishing on many levels. I am passionate about working with people, using my counselling skills and over a period of time observing how the distress and emotional pain become more manageable. When asked What is counselling I often describe it as a safely held place to unpack all that is overloading your mind, sifting through it with guidance letting go of some, then rearranging the rest so that your world starts to make sense and become manageable again. I read and learn constantly from others more experienced than myself to add to my knowledge and use continual professional development courses to enhance my Counselling Profession. I work with commitment and dedication in a professional supportive capacity with many of my referrals coming from personal recommendation. 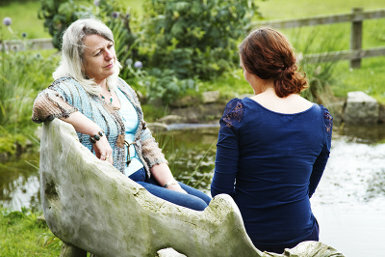 On a voluntary basis for the Cornwall Hospice as a Bereavement Support Worker. Prior to my Counselling Training I have mostly been self employed in business. "Jill never stop doing what you do, you always accepted me as I was, a constant when my life was in such turmoil." "To change one's life: Start immediately Do it flamboyantly No exceptions"